Easily search for all Westridge Valencia homes for sale by clicking the "Search" button in the display above. The three most recent Westridge homes that have come on the market can be found at the bottom of this page. Come back here often to see what's new...or better yet...save a search for Westridge homes and new listings will be automatically sent to you! The neighborhood of Valencia Westridge is very desirable because it offers many executive home and townhome styles of living in a golf course community; the Valencia Tournament Players Club wraps through the Westridge home tracts, providing many homeowners with sweeping views of the Santa Clarita hills and lovely Tournament Players Club golf course views. The nearby old growth oak preserve is a beautiful counter point to the modern Westridge luxury homes that overlook the preserve. Valencia Westridge is in the zip code of 91381 and located on the west side of the Santa Clarita Valley - west of the Interstate 5 Freeway - just outside of the Santa Clarita city limits, in an unincorporated area of Los Angeles County. Westridge is located directly north of the community of Stevenson Ranch, which is also located on the west side of the Interstate 5 freeway. 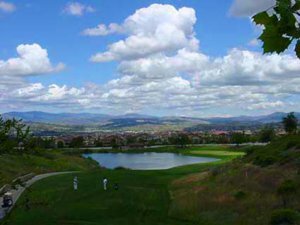 The picturesque rolling hills of Westridge provide views of the Santa Clarita Valley to the east, and the mountains to the north, which offer beautiful snow capped views on many winter days, and the Santa Susana Mountains to the south bordering the San Fernando Valley. And on summer evenings, homeowners may enjoy a fireworks display from Six Flags Magic Mountain which is located north of Westridge. And there is plenty to do in addition to golf! 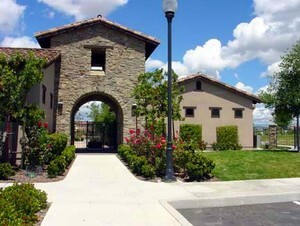 The Westridge Homeowner's Association includes a beautiful recreation center, with a Junior Olympic swimming pool, spa, tennis courts, play areas, gardens, barbecue areas, miles and miles of walking trails, and the magnificent Oak Preserve. Westridge is conveniently located near the Interstate 5 freeway for those commuting, and within 40 miles of downtown Los Angeles, with all the things to do that LA offers! Westridge is minutes away from boating, fishing, and water sports at the nearby lakes - Castaic Lake, Pyramid Lake, and Lake Piru. And, of course, shopping and restaurants are nearby at the Valencia Marketplace, the Westfield Valencia Town Center Mall, and various independent shops and restaurants. Nearby Westridge schools include West Ranch High School, Rancho Pico Junior High School, a California Distinguished School, and Oak Hills Elementary School, a California Distinguished School. Bella Ventana, built by John Laing, is a gated community of luxury paired homes, many having golf course views. Cypress Pointe, built by Shea Homes, are townhomes with small backyards for easy outdoor living, many with beautiful views of the Santa Clarita Valley and views of the TPC. Sizes range from 1570 to 1725 square feet. Cypress Pointe townhomes offer open floorplans, and direct access to the 2 car garages. San Abella are detached cluster homes with smaller yards built by MBK homes in 2003. 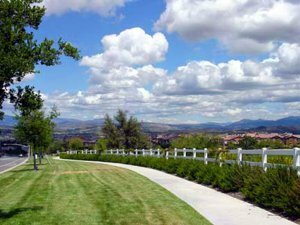 Sundance Homes, built by Richmond American, are single family homes in a gated community, many with expansive views of Santa Clarita. Bent Canyon, approximately 3120 to 3450 square feet, and Montanya, approximately 2660 to 3650 square feet, both built by Centex Homes in 2003, are beautiful single family homes with distinctive floors plans, many having sweeping views of the Santa Clarita Valley. Masters, spacious single family beautiful executive homes. Some plans feature a "casita" - a separate living quarters, or separate office. Emerald are executive single family homes, built by Greystone Homes in 2003 and range in size from approximately 3560 to 4100 square feet. The gated Westridge Estates, beautiful custom built homes in Westridge located with views of the Tournament Players Club and overlooking the Santa Clarita Valley.